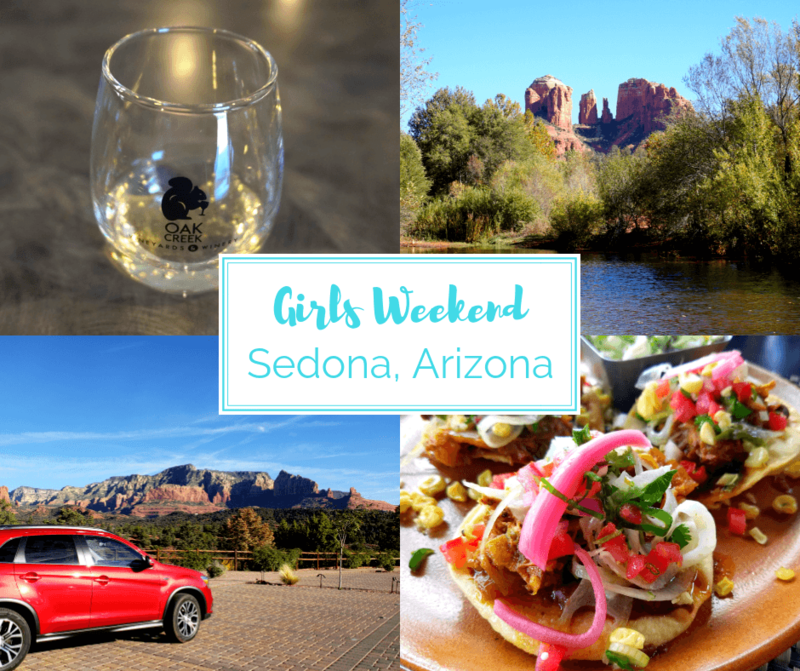 Enjoy a perfect Girls Weekend in Sedona, Arizona! Our guide includes popular Sedona hikes, Sedona wineries, and the best Sedona restaurants! My bestie Alicia and I were celebrating 15 years of friendship. We met in Army Basic Training; she had the top bunk and I had the bottom bunk. And we’ve been best friends ever since! We decided Arizona would be a fun place to meet up, hang out, do some hiking, and take some photos. Alicia is an awesome photographer (check out her Instagram), and I’m not just saying that because she’s my bestie lol! Turns out Sedona was the perfect place for our Girls Weekend! We had such an incredible time and made so many new memories! Getting to Sedona from Phoenix is really easy. Actually, for anyone looking into day trips from Phoenix, we highly recommend Sedona because the trip from Phoenix to Sedona is just under two hours. That’s if you drive it straight, without pulling over at all. Which may be hard to do, since the landscape is pretty cool. For our Sedona girls weekend, we had a 2018 Mitsubishi Outlander Sport. We named her “Red” and she was the perfect companion for our weekend in Sedona. We loved the smooth ride, comfy seats, the 7″ HD touchscreen display audio system, and especially the panoramic glass roof. There was also plenty of room for our bags and camera gear. There are plenty of hotels in the area, but we think one of the best places to stay in Sedona is in an Airbnb. With the amount of Sedona attractions there are, we don’t think you’ll be spending much time at your accommodations so you don’t need anything super fancy. Plus, chatting with your host could lead to finding some hidden gems in Sedona. Pro Tip: Click here to join Airbnb and earn $40 off your first booking of $75 or more. One of the main reasons we chose Sedona for our girls weekend getaway was to hit the Sedona hiking trails and take landscape photos. We had researched ahead of time which Sedona trails we might want to check out, but once we got into town, we also asked some locals we chatted with. Not surprisingly, everyone had their own opinions of which were the best hikes in Sedona. We were able to do a few Sedona hikes, including the Bell Rock Hiking Trail and the Crescent Moon Ranch Hiking Trail. Neither was difficult, both were well marked, and both offered beautiful landscapes. Crescent Moon Ranch lies along Oak Creek. Isn’t it beautiful? Not necessarily a hike, since you can drive most of the way up, but the Chapel of the Holy Cross is also beautiful and one of the top Sedona attractions. There are a few small parking areas along the road as you head up, so it’s up to you whether to park as soon as you see an open spot or keep going in the hopes you’ll find another open spot. The chapel itself is small, but beautifully built right into the landscape. And the views are spectacular! Fun Fact: We stayed hydrated during our Sedona hikes thanks to our LifeStraw water bottle. Call us crazy, but we had no idea there so many Sedona wineries or Sedona wine tours. What a pleasant surprise it was to discover that there were a few wineries near Sedona and that we could enjoy some wine after our days’ adventures (it’s like when we were road tripping across the Midwest and discovered over 100 Iowa wineries!). After one of our day hikes, we decided to stop in to Oak Creek Vineyards & Winery. If you’re wanting to do some Sedona wine tasting, this is the place to go. Since the weather was so nice, we decided to do our wine tasting outside on their patio. Whenever we were done with our current selection, we simply walked inside and were poured the next wine on the list. Oak Creek also has snacks and we HIGHLY recommend their Gourmet Plate which has a selection of aged cheeses and cured meats, dried apricots, olives, sweety peppers, fig jam, crostini, and cheese crisps. Holy moly, it was delicious! So eating that, while sipping on delicious wines, and enjoying views of the vineyard and rolling hills with my bestie just made it such an awesome day. Wine tasting in Sedona with a boozy squirrel! This Gourmet Plate was insanely good! Another great place to do some Sedona wine tasting is Made in Arizona Wine and Gifts in Uptown Sedona (a perfect stop after doing some shopping). Hopefully Anna Lee is there because she is awesome and we were all laughing and having a great time during our wine tasting. So, we’ll just start off by saying the food in Sedona is amazing. What we’re going to list are just some of the best Sedona restaurants. It’s a good thing we did all that hiking, because there are so many good places to eat in Sedona! Of course, Mariposa will always be considered one of the best restaurants in Sedona with a view. You can see for miles from the parking lot, courtyard, and thanks to its large floor to ceiling windows, you can also enjoy spectacular views from inside the restaurant. And the Latin inspired food is pretty amazing as well! Another one of the best Sedona restaurants is Pump House Station. We heard about this Sedona eatery thanks to our Airbnb host. The restaurant itself is rustic and cozy, with a nice outside patio area. We started our evening outside, but as the temperature dropped we decided to move indoors. We had so much delicious food here, we almost had to be rolled out! To start, we had a Creamsicle Martini that was heavenly. Next we had the House Made Flatbread with creamy brie cheese, fresh figs, bacon, and shaved brussels sprouts. This was our appetizer, but it totally stole the show. My mouth is watering as I type this. Then we had the Shrimp Fettuccine Pasta and Flan for dessert (I’m a sucker for flan). Everything was so incredibly fresh and every dish was prepared perfectly and had intense flavor. We will definitely be going back the next time we’re in Sedona. Another one of the best Sedona restaurants with a view is Creekside American Bistro. We went there for breakfast one morning and it was so peaceful to sit outside and enjoy the view while we ate our yummy Avocado Toast. It was the perfect way to start the day! We also want to mention Thai Spices. You guys should know by now that I’m addicted to Pad Thai, and the Pad Thai we had at Thai Spices was one of the best we’ve had in years. We felt like we were back in Thailand! Alicia also liked her Ginger Pina Colada a lot. The food here is so authentic and Thai Spices has actually won the Best Sedona Restaurants Award for 15 years! Alicia and I had so much fun on our Sedona Girls Weekend! We loved driving around in our Mitsubishi Outlander, exploring the Sedona trails, checking out the Sedona wineries, and eating at some of the best Sedona restaurants. And of course, spending time with each other. Here’s to another 15 years! Arizona is one of my favorite states to visit. There is sooooo much I love about the state. It is nice to see you and your friend enjoy your time together. You probably enjoyed putting your toes in that Arizona sand. A great state with two great people. Now that is great. You are very graciously welcome oh great ‘Buddy’. Great Army shot Vicky! My cousin and his fam went to Sedona regularly when he lived in Maricopa. Genuinely a place for wellness and inspired natural beauty. Great write up, great pictures, but more importantly, great peeps! These photos are amazing! Thanks for taking the time and sharing them with me. Looks like a spectacular trip! Thank you for sharing, wonderful write up of your adventure. Would you mind sharing what your budget was?